Reportedly, Chris Pratt and his rumored girlfriend Katherine Schwarzenegger was spotted kissing right after a church date on Sunday with Pratt’s 5-year-old son, Jack. Katherine, 28, is the daughter of actor and politician Arnold Schwarzenegger and journalist Maria Shriver. This is the second public outing together after they were caught on a lovely picnic. The pair allegedly were set up by Schwarzenegger’s mother, Maria Shriver. They have been on multiple low profile dates and have been talking consistently for the last two months or so. Needless to say, This is the first confirmed relationship of the 39-year-old actor since his break-up with Anna Faris in August 2017. Pratt and Faris broke everyone’s heart when they announced they’re going apart after eight years of marriage. Now, they’ve both since moved on to new relationships. On Monday, photos hit the internet that displayed the Guardians of the Galaxy star kissing and grabbing ice cream with Katherine Schwarzenegger. That’s not all, Schwarzenegger is a woman who Pratt has picnicked within Santa Barbara. Neither Pratt nor Schwarzenegger has confirmed a romance. However, it’s good to know that fans are happy about this potential pairing. The “Guardians of the Galaxy” star Chris Pratt and Katherine Schwarzenegger have been dating each other for some time now, but the two aren’t exactly hiding their affection for one another. Who Is Chris Pratt’s Girlfriend Katherine Schwarzenegger? 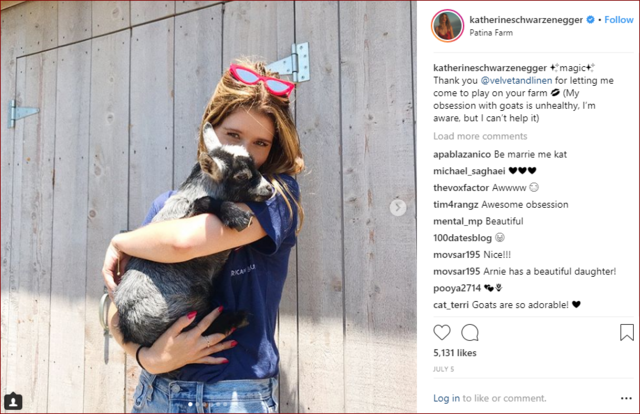 Katherine Schwarzenegger is an author, widely popular for her books and blog. She runs KatherineSchwarzeneger.com. Her blog emphasizes lifestyle, beauty, and health. It resembles an activist platform. Katherine is an animal rights activist. She has posted lists of adoptable dogs. Schwarzenegger uses the site to create awareness for charitable causes, like Santa Barbara Humane Society. She has even written articles regarding how to help homeless pets. Katherine is also the sister of Patrick, current star of romantic drama Midnight Sun. Katherine has built a career in the lifestyle space as well.